Uber driver protesting ‘Vaxxed’ film meets Philly vaccine pioneer: Craig Egan drove across the country this summer to disrupt a bus tour launched by the makers of the film Vaxxed, a group that questions the safety of vaccines. 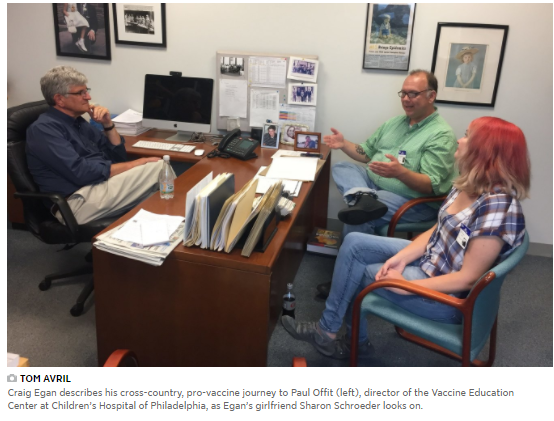 The tech salesman-turned-Uber driver came to Children’s Hospital of Philadelphia in search of a friendlier audience: vaccine inventor Paul Offit, who developed a vaccine for rotavirus that has saved hundreds of thousands of lives since its approval in 2006. David Colquhoun: The A to Z of the wellbeing industry: from angelic reiki to patient-centred care: The wellbeing industry: a spectrum of attitudes and practices predicated on the notion that positivity necessarily equals health. We know that depression leads to worse health outcomes for people, but does simply being positive necessarily mean we will be healthier? A lot of people believe it is and that’s enough to open the door for a host of alt med practitioners to peddle their version of wellbeing. Bottom line: go ahead and be positive, but be sensible too and look after your health. Positivity is not a good substitute for health care. Doctors still have a role in maintaining your health. Melbourne doctor raided amid claims GPs helping parents avoid vaccinating kids: Health authorities have raided the clinic of a Melbourne doctor accused of helping families avoid compulsory child vaccination. Medical schools are shaking off a dark past by honouring people who donate their bodies to science: The generosity of people who donate their bodies to science is recognised and honoured by medical schools. Current generations of medical students are able to train thanks to the service and kindness of these individuals. Aristocratic Dental Cream Gets Squeezed: The Popularisation of Modern Toothpaste. An essential part of tooth care and oral hygiene (both of which can affect the health of the entire body), the first modern-looking “tubes” of toothpaste were based on containers for canvas paints. The anatomy of a detox scam: Detox – Britt Marie Hermes talks about the scam she set up during her time as a naturopath to sell detoxification for wellness. Detox is based on the idea that the body needs help to clear toxins and balance the body through diet. Easily falsifiable concept, but one that still holds sway over many. ‘Pen’ identifies cancer in 10 seconds: Cancer surgeons may be able to detect tumours in under 10 seconds. This cancer-sniffing device may be thought of as a magic wand that surgeons touch to a piece of suspicious-looking tissue, before placing in an analyser. The tiny sample can be used to profile the proteins, lipids and metabolites in the tissue and determine whether it is likely cancerous. This could revolutionise cancer screening and diagnosis – doctors could identify multiple lesions within one procedure, avoid performing unnecessary biopsies and more quickly direct treatment.